As I had noted earlier this week, I have not had a lot of Magento development time lately, so today I thought I’d spend a bit of time setting up a Magento 1.5 development environment on my Mac. This post will take you through the steps to set up Magento development with Eclipse for editing/debugging and SVN for version control, with deployment being managed by Modman. This relates to the project structure I described in my presentation at Magento Imagine, with the exception that I won’t go into detail about setting up a separate extensions repository, as that is probably more relevant to developers who build and release extensions than developers working on a single Magento project. SVN for version control, but Git can work too. Installing SVN, Magento and Modman. Getting a free SVN repository. Setting up a Magento store development project with version controlled extensions, templates/themes, locale and emails. Development and deployment of changes to Production. We have a lot to get through, so let’s not delay. We’ll zap through a commandline install. We’ll be installing into your web server doc root. If you would like help setting that up I wrote a guide to installing MAMP on a Mac (a long time ago) and also (extra for experts) a guide to setting up virtual hosts on MAMP too. 2010 is now well and truly behind me and I am sitting inside on a sunny day (sunburnt) reflecting on the year that was. It’s been a busy year. I thought, more so for my own sake than yours, that I would jot down a few notes to wrap things up. Firstly my blog, Aschroder.com. 2010 has been good to me in several respects. From a traffic point of view my final tally (according to Google Analytics at least) clocked in at a touch over 100 thousand visitors and over 200 RSS subscribers, I feel like this is a recognition of the quality of my continued articles on Magento development. Wow, where did November go? It’s been over a month since my last post and I thought I should probably just drop a quick note here to let you know what’s been going on, and what’s coming up. There’s no Magento tips or advice here though I’m afraid – but there is a little sneak peek at a project I have been tinkering around with – I’d really love some feedback on it. Firstly, if I haven’t been making Magento extensions or writing Magento articles for a month, what have I been doing?! The first 5 Magento Installations I do will be free! Whats the catch? You have to provide me a review of the work I do and my professional service in general that I can put on my blog for others to see. Simple eh? I’ve decided to start offering Professional Magento Installations as a service, there is high demand for a well installed Magento. All too many people with not quite enough knowledge or skills are having a go at it then ending up with failed installations. I have helped a number of people on the Magento forums who for a small fee could have saved themselves hours of headaches and had the work done quickly by a professional. My standard price will be $99, I see that Magento themselves charge $149 – so naturally I wanted to make my Magento Installation cheaper without cutting back on quality or timeliness. I will often be able to install same day, and usually install within 2 days. Of course the price is ZERO right now for a limited time I’ll install your Magento for FREE, so if you are contemplating it, get in touch with me. Because I haven’t offered any professional service on this blog before I thought I’d offer to do the first 5 Magento Installations free of charge to get some references from happy customers! So if you want your Magento installed for you by an expert, check out my professional services page. Be in quick, I’m sure this won’t last. There is a lot going on when Magento actually sends a cart to Google Checkout, even more so if you are using Merchant calculated shipping. As a result lots of things can go wrong, with the merchant calculated shipping callback or with the actual server to server posting of the cart contents. To help you with diagnosing problems I thought I’d shared my top 3 methods for finding out what is going wrong when Magento and Google Checkout are not communicating properly. 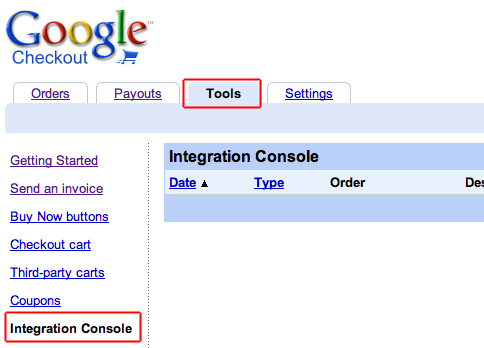 The first and most obvious place to try is the Google Checkout Intergration Console. As you can see in the screenshot below the console is hidden away in the Tools tab of the main seller dashboard. You’ll find it at the bottom of the left menu. The Intergration Console is tucked away in the tools tab at the bottom of the left menu. If the Google callbacks have failed or incorrect XML has been sent to Google you will find a report of the errors here. It is a good idea to keep an eye on the timestamps as you do not want to wind up chasing an old problem. It’s also good to periodically check this console while in production, just in case something starts to go wrong. I found when I upgraded to the latest Magento that the HTTPS callback was failing, but I hadn’t found it during development because I do not use SSL in development environments.